Unless otherwise indicated, this position may be filled at the assistant, associate, or full professor rank depending on the successful candidates’ qualifications and experiences. Each applicant should hold a doctoral degree in Civil Engineering or a closely related field by the starting date, and demonstrate interests and expertise in inter-disciplinary research and undergraduate and graduate teaching. 8. one representative publication published between August 1, 2012 and August 1, 2017; five selected publications published between August 1, 2010 and August 1, 2017. Applicants should submit an application package to Dr. Shang-Hsien Hsieh, Professor and Chairman, Department of Civil Engineering, National Taiwan University, No. 1, Sec. 4, Roosevelt Road, Taipei 10617, Taiwan. For more information, please visit http://www.ce.ntu.edu.tw. 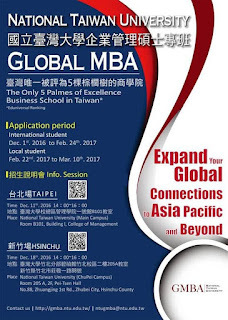 National Taiwan University College of Management Global MBA (Global MBA) 2017 enrollment has started. The NTU Global MBA is hosted by the only 5-Palms Business School in Taiwan, providing Dual Degree and Exchange opportunities with both part-time and full time options at an affordable price. The GMBA admission info sessions will be held on 11th and 18th of December 2016. Registration for foreign applicants begins on 1 December 2016, while Taiwan local applicants will begin on 22 February, 2017. 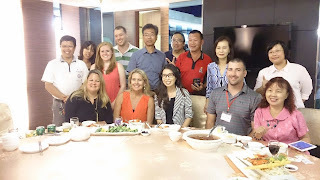 Or contact Ms. Hsin Yeh at yehhsin@ntu.edu.tw or Ms. Christy Chiu at christychiu@ntu.edu.tw.